At the height of the European Cup row, one party risked its reputation by refusing to publicly declare its position. While it kept quiet, everyone else's stance was pretty clear. On the one hand, the English and French clubs announced their plans for a breakaway tournament - supported by the Welsh regions - and, on the other, the unions of Scotland, Wales, Ireland, Italy and France pledged their support to the status quo; the Heineken Cup, run by current organisers European Rugby Cup (ERC). Who was part of the debate? Rugby Football Union, Irish Rugby Football Union, Scottish Rugby Union, Welsh Rugby Union, Federation Francaise de Rugby, Federazione Italiana Rugby. Premier Rugby, French Rugby Federation, Regional Rugby Wales. The Rugby Football Union, however - led by chief executive Ian Ritchie - kept its counsel. And as the dust settles and the ink dries on the contract for the brand new European Rugby Champions Cup, it is apparent that this stance - one of consolidation and conciliation - has borne fruit. "I think I must be slightly old fashioned in that I do believe it's much better to have discussions like this mainly in private, and mainly keep them confidential," Ritchie told BBC Sport. "But I think we have a very vibrant competition going forward, and stability too over a long-term period." 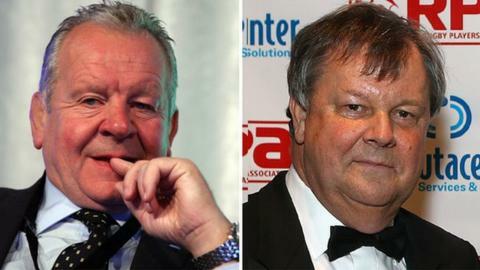 Over the course of the past few months, Ritchie - as well as RFU chairman Bill Beaumont - has emerged as a key figure in the negotiations. Because of the RFU's unique position - independent of, yet empathetic to, the wishes of the English clubs, but also unwilling to burn bridges with the other unions of the Six Nations - Ritchie and Beaumont were able to act as mediators between the warring factions. "We don't have a financial nexus within the competition, the RFU doesn't get any money, and therefore we were able perhaps to play a bit of a broker role," Ritchie explained. "The meetings were extremely heated, but end result is what is most important. I'm just so delighted for the fans of the game, and I know speaking to England players they really wanted to play in a vibrant European competition. I think everyone comes out of this as a winner." Ritchie's neutral position proved vital when approaching the thorny issue of the broadcasting rights, with both BT and Sky signing conflicting deals in summer 2012. Even though the tournament structure and a rough governance model were largely agreed at the start of the year, the TV deal remained the elephant in the room. However, with over 20 years of experience in the broadcasting industry - he is a former Channel 5 chief executive and joint chairman of Sports News Television - Ritchie was able to act as a intermediary between the two companies. He eventually organised and chaired face-to-face meetings between Barney Francis of Sky and his BT counterpart Mark Watson. The result was an agreement in principle to share the rights. "I have to pay tribute to the broadcasters for being prepared to enter into discussions," Ritchie added. "They were both conscious of their broader responsibilities." During the saga, Ritchie attended over 20 detailed meetings between the various stakeholders, and was involved in "umpteen" other phone calls and liaisons with various protagonists across Europe. But while he is reluctant to dwell on his own role in the resolution, Beaumont has no doubt that without Ritchie, there would be no European Rugby Champions Cup to look forward to next season. "He was the one person who could actually speak with authority regarding the two TV companies," Beaumont insisted. "He knew them well, he knew the individuals involved, and he was probably the only person who could pull that together, and that was an integral part of doing the deal. Once that was done it was just a matter of trying to put the final piece of the jigsaw into place." While Ritchie was able to call upon his experience in the broadcasting industry and other sports, as well as a fresh approach to rugby administration having only joined the RFU at the start of 2012, Beaumont - a former England captain and a highly respected figure in the game - used his stature to good effect when heading up many of the meetings in his guise as chairman of the Six Nations. And Beaumont says that, although negotiations with the other unions became fraught, communication never broke down. "Even though we may have disagreed, we were still mates and we would still go and have a pint after the meetings," he said. "That's old rugby, and that's what we did. I have a good working relationship with the other countries, and I think we've reached a compromise that will suit all parties." The European Rugby Champions Cup will give a cash boost to all involved, with the clubs having a greater say in maximising the competition's commercial potential. There will also be fewer sides from the Pro12, with Italy and Scotland only likely to have one team involved next season. But Beaumont and Ritchie both reject the suggestion that a stronger, more lucrative club competition could damage the integrity of the international game, as has been the case in football. "You have got to recognise that rugby union only went professional in 1995. That's a really short time ago," Ritchie explained. "What you are looking at is a continuing transition between all the elements of the amateur game into the professional game." Indeed, rugby union is entering into a new phase, with clubs in England and France especially desperate to ensure the sport grows in the face of both economic and social pressures. "It's not surprising that the clubs want a say in how the competitions are run, so you have to find the right balance," Ritchie continued. "I think we all recognise there needs to be strong growth of rugby in Europe. I don't think you can characterise this either way as a win for one or another. "This is about modernising the game, and we have to continue to do that." In the meantime, Ritchie is free to return to his day job, admitting that the "next priority" is to strike an agreement with the clubs regarding compensation for when the World Cup takes place in 2015. But he has no doubt the tribulations of the past few months have been worthwhile, although he baulks at suggestions he is the man who "saved" the European Cup. "I don't think so at all. I think there are plenty of other people involved. "It's helpful to have a bit of knowledge from other sports, which I've had before I came here, and it's helpful I have spent 20-odd years in broadcasting. But there was a large group of people who did this. "We spent a lot of time with Mark McCafferty and Bruce Craig at Premiership Rugby, and there was a lot of imagination and creativity coming out of them to try and secure this deal as well. So you have to look at this as a team approach. "I think it's been well worth the effort. We have a very exciting competition ahead, and a great future for the game in Europe."